RealAutoTips. - When you want to design by your self Wiper Speed Control, you must know the circuit diagram that will drive this wiper. In here we will show you one of the Circuit Diagram Wiper Speed Control using LM555 IC like in figure 1 below. 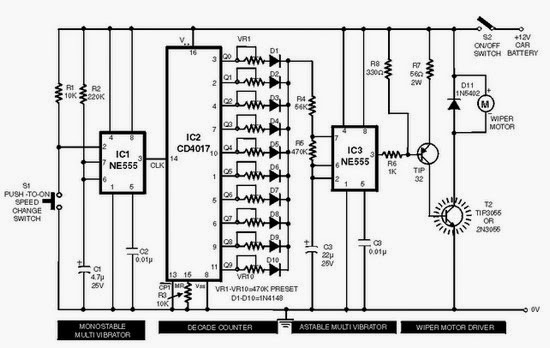 Circuit diagram like in figure 1 above is Circuit Diagram Wiper Speed Control using LM555 IC. A continuously working wiper in a car may prove to be a nuisance, especially when it is not raining heavily. By using the circuit described here one can vary sweeping rate of the wiper from once a second to once in ten seconds. The circuit comprises two timer NE555 ICs, one CD4017 decade counter, one TIP32 driver transistor, a 2N3055 power transistor (or TIP3055) and a few other discrete components. Timer IC1 is configured as a mono- stable multivibrator which produces a pulse when one presses switch S1 momentarily. This pulse acts as a clock pulse for the decade counter (IC2) which advances by one count on each successive clock pulse or the push of switch S1. Ten presets (VR1 through VR10), set for different values by trial and error, are used at the ten outputs of IC2. But since only one output of IC2 is high at a time, only one preset (at selected output) effectively comes in series with timing resistors R4 and R5 connected in the circuit of timer IC3 which functions in astable mode. Read more using link below.